So I finally managed to get my hands on my family's camera (always a challenge) and get started on making a blog (what's a blog without pics right?). I imagine this will become a rather odd meandering through my mind, going from pics of models in progress to various bits of fluff I've half written to battle reports. Maybe I'll even stick to one topic for two or three posts in a row! 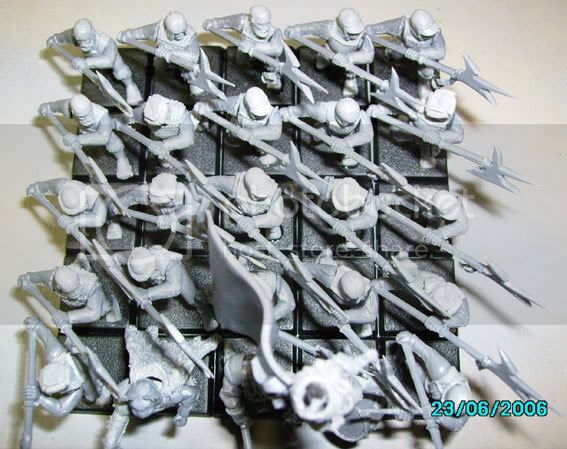 These guys are a unit of 25 Heavy Halberdiers (count-as Greatswords). I was inspired by the fact that no one fields Halberdiers but the fluff goes on and on and on about them being the 'backbone of the Empire'. Hence, I figured I should have at least one unit, and this way they might actually see a game or two! 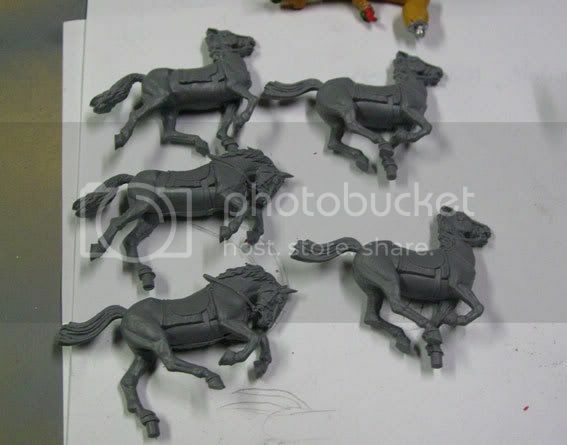 Very nice use of both new and old plastic sets, I cant wait to see them painted. I still need to give him a final run over with a fine file to make sure I've got any dust/glue/mould lines I've missed. It looks like he is the lone survivor in a particularly brutal battle! First up we have the *really* work in progress pic. 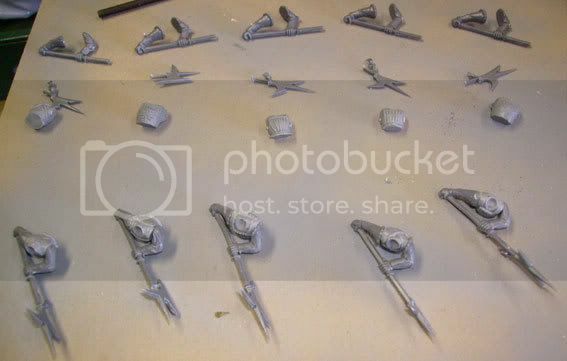 This is how I assembled the unit, each body and Halberd separately in groups of five, then glued them to the legs and made sure they ranked up with the guys in front. 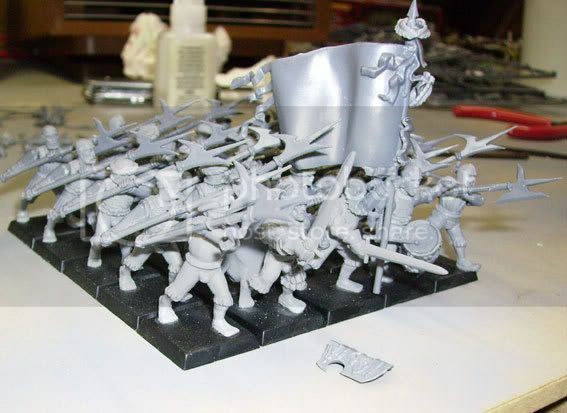 Not your fault, but man a whole unit, where every figure is holding their halberds like that looks pretty meh to me (especially since I wouldn't swing a halberd like that ). Reminds me of the 4th/5th edition single pose plastics. 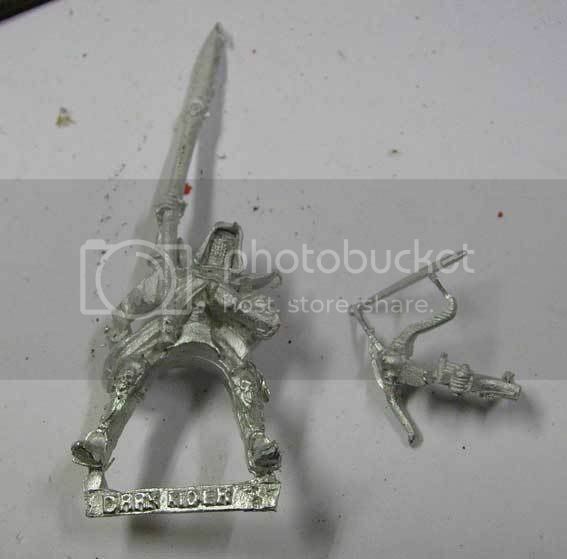 I do like how you used the 6th edition bodies, but I must ask, why not the 6th edition halberd arms? 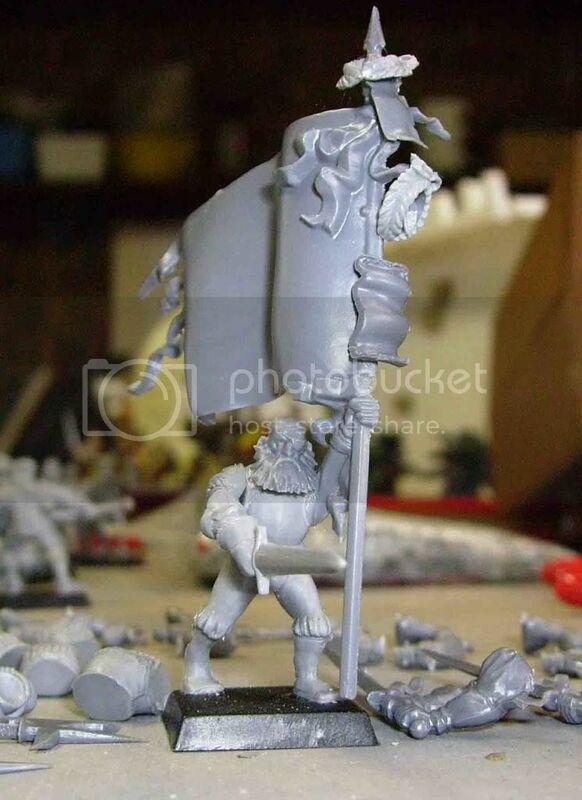 That standard bearer is spiffy looking to. I do agree, the new halberds look heftier and overall cooler looking. 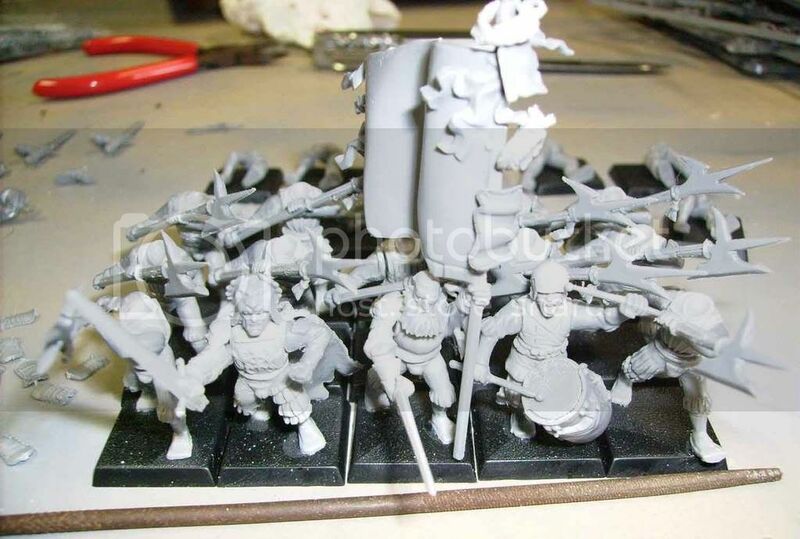 Cool idea with the heavy halberdiers, just such a shame we can't give them HA in game . Yay for updates . Unfortunately, current updates aren't of the Heavy Halberdier unit that I know you were all hanging out for (lol ). 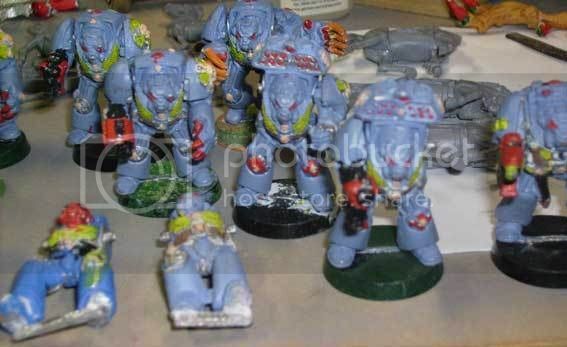 They're going to remain on hold for a little while while I obtain/mould the armour plates for their legs - if anyone has any of the plates from the 6th Ed. soldiers box, I'd be very interested! (I need at least another 12 pairs, preferably a few more). 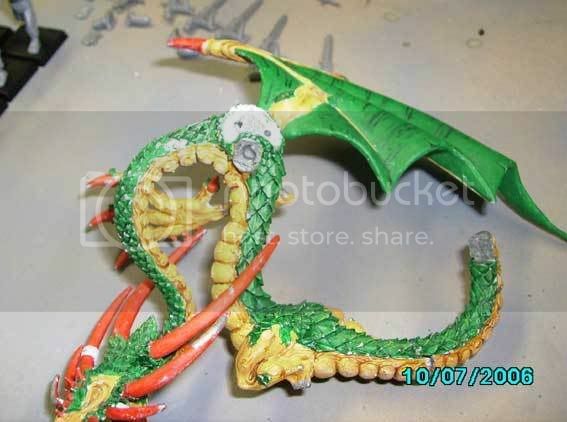 So after thinking it over for a little while, I ended up picking up this rather battered Wood Elf dragon for $A20. 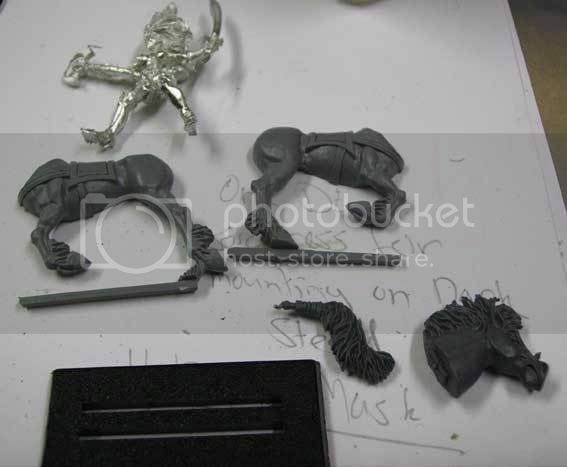 Doing a little research now, I'm fairly sure this is an OOP one, because the only dragon in the WE section of the online store seems to be the Sisters of Twilight one, which is similar but not quite the same. The wing that's not there now was originally glued on, but came loose when I wiggled it a couple of times, so I figured I'd pin and reglue it to make sure it wouldn't shift again. I punched a few pins into the shoulder joint, then pinned and glued the section of tail that was loose. 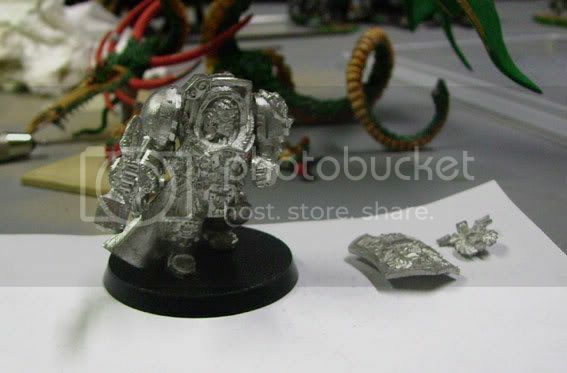 Random pic of the Lord that comes with the Dragon....for sale or trade if anyone wants him. Closeup of the pins in the shoulder joint. I cut them a little shorter before gluing the wing into place. After the wings are glued into place. 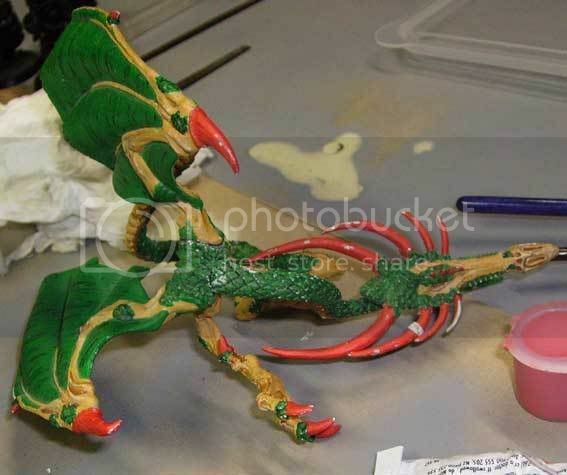 Plan for this model is to create an armoured dragon for KF (inspired by Eragon - terrible writing style that ripped off a fair few people, but I like the idea of an armoured dragon - why wouldn't you protect such a valuable resource with everything you've got?). Haven't quite decided what I'm going to use for KF himself yet, except for the fact he's going to have some shockingly huge banner - which reminds me, anyone know some good tutorials/tips for creating paper-based banners? 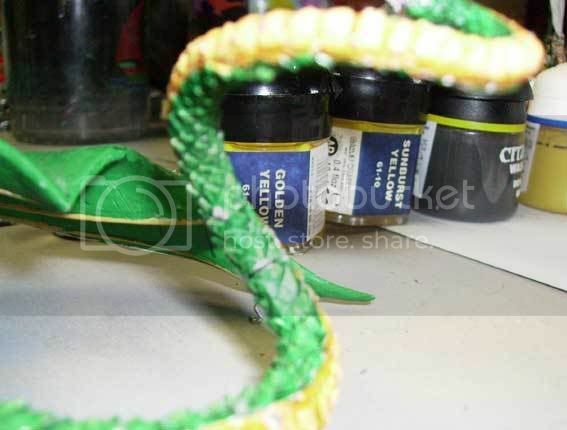 I'm wondering if I could use watered down PVA glue to help it hold it's shape. 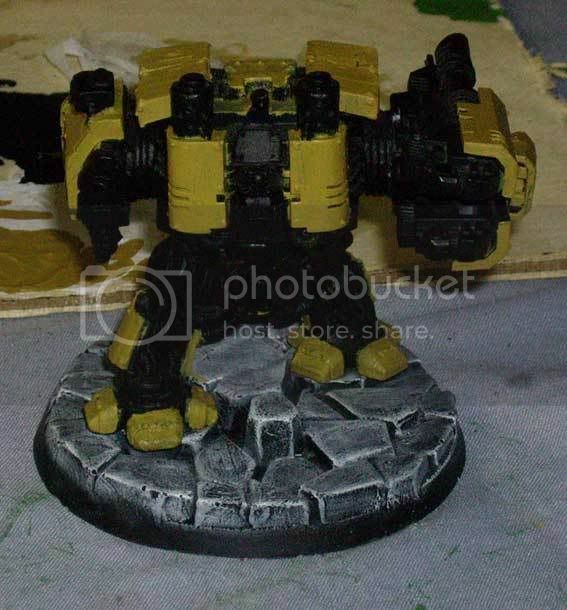 I've got some pics of some more projects I've got on the go (FC detachments, Space Marine Dreadnought, Captain Lysander of the Imperial Fists), but I don't want to go overboard and chew up everyone's bandwidth . I'll post them up in a few posts time. Thats pretty nice there. About the banners. I'm no expert but pva glue will tend to liquefy again when it gets wet. (at least my does its regular Elmer's glue.) I've seen banners on this website made of metal and such so you might wanna try browsing around. I wish i had that too since my swordsmen unit is only made up of 19 guys, needs to be 25 for my purposes. You don't happen to have some more of them just lying around? Oooo, I hadn't thought of that one. That would be perfect, cheers. Unfortunately, no. 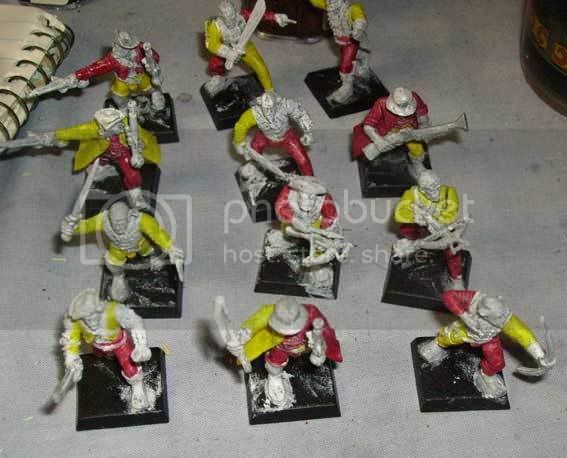 I'd picked up one of the old Battalions cheap at a GW auction and I used up all the bodies on the HH unit. Sorry! Yay for updates . First off, thanks to everyone who's responded so far. Reading back, I noticed I've been a bit of a rude bugger and haven't said anything. I shall go and do something in penitence if anyone has any good suggestions . Today I had a couple of hours free due to a minor bout of food poisoning which meant no work/uni. Funnily enough, I was over it by lunch time after being laid out since mid-afternoon yesterday...fickle are the ways of the human stomach! Lysander in pieces, with his shield arm glued. Next stage, with hammer arm glued, and glued to base. Icon glued to armour, ready for painting. I intend to paint him before gluing the shield on, simply to make my life a little easier. 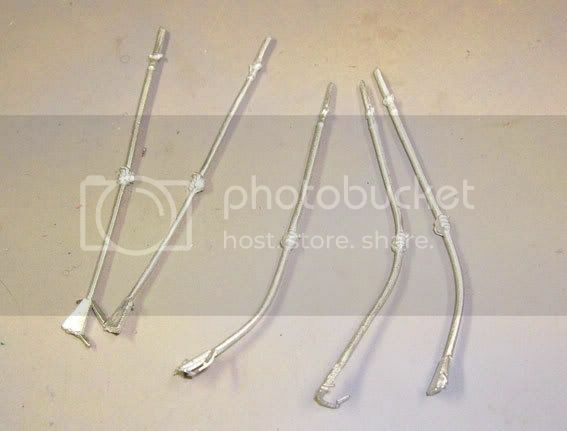 I thought lances were meant to be straight? Straight lances after a bit of work. 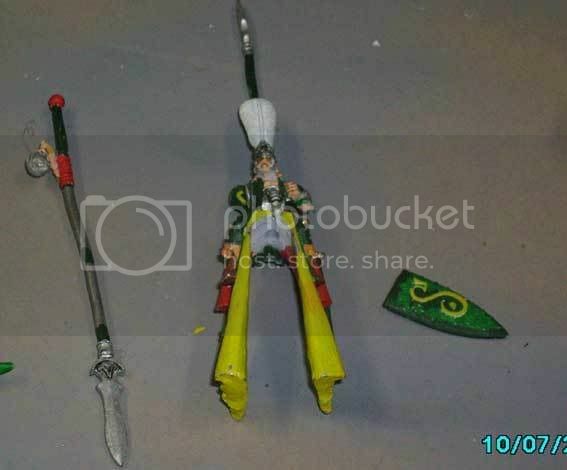 Now to glue the lances on...tricky part will be the fact that the wrist joint looks like it'll be too thin to pin; then again, I thought the same thing about the Dragon's ankles and they *seem* to have worked. 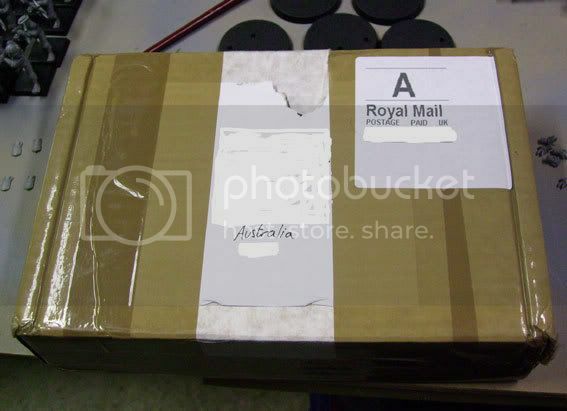 The contents of said box. 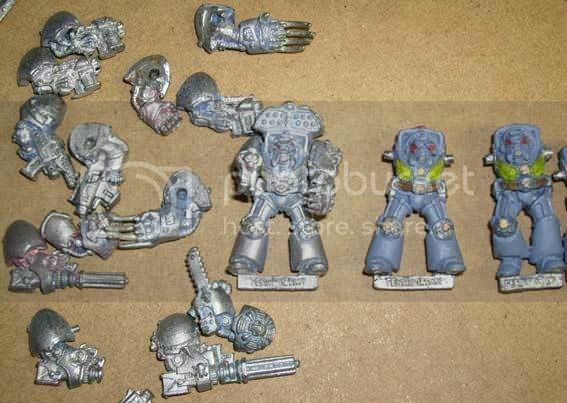 Slightly closer pic of Terminators. Much fun is going to be had converting/painting these guys. 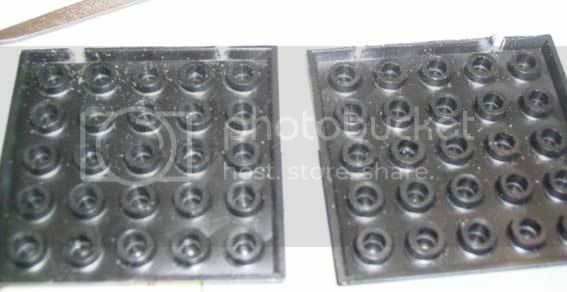 First trick is going to be putting them on new bases, which I intend to pick up next week. 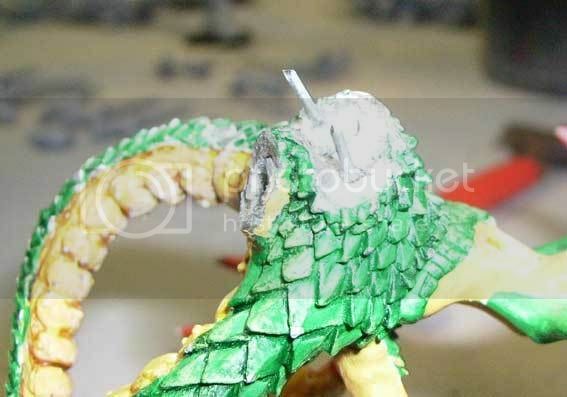 I also punched some holes in the Dragon's legs today ready for pinning the feet, but unfortunately the pics of that particular little endeavour didn't come up so well. 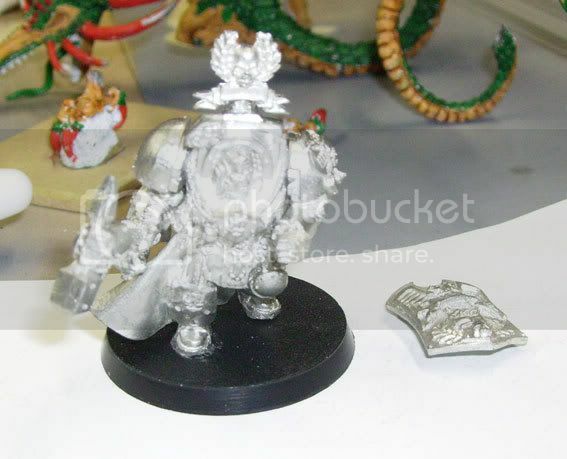 Firstly nice empire minis man, keep the updates coming. Glad you got the termies, excuse the painting it was done when i wa smuch much younger and didn't know any other techniques than paint and play. 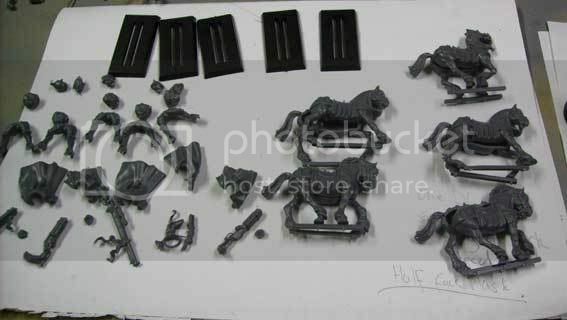 Yeah jigsaw The woman asked what was inside and i was sure she wouldnt understand if i said terminators (Or she might have nabbed them for her army) so i said jigsaw and said you loved them, especially the ones form ireland as their softer to touch. Haha, cheers. And when you think about it, they are *kinda* a jigsaw. Tehe. 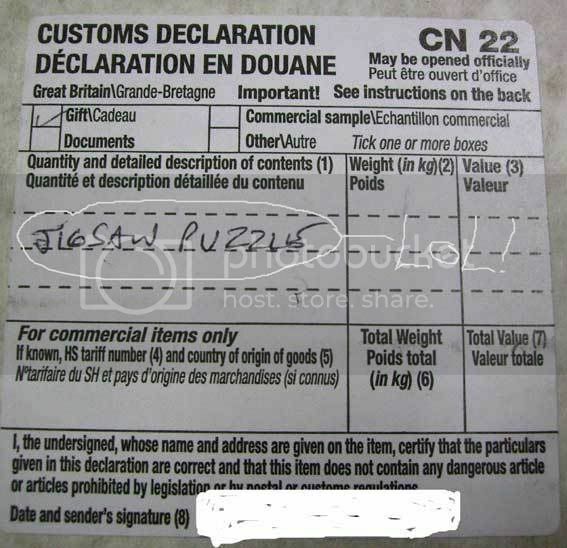 And what's this about jigsaws from Ireland being softer to touch? Just put what I also put, metal/pewter figurines. Some other ones I use are: game figures, plastic/metal toys, and assorted game figures. I do have to admit, that jigsaw bit is kinda funny. Yay for updates . First up, we have my list for our local tournament in two weeks. It's basically your standard battalion setup. I see my biggest weakness as heavy magic, but I intend to use my Captasus aggressively in attempt to thwart casters before things go sideways. All 4 rounds use the normal Victory Points (henceforth VPs) rules, unless stated otherwise. As per scenario in Warhammer basic rule book. The enemy general did something not so nice to you general, THEY MUST PAY! They insulted your mother, Make them pay!! The aim is to kill as much of your opponents army as possible. No Victory Points (VPs) for units reduced to below half strength or table quarters. VPs for standards and general as normal. Both armies have fallen upon a strange outpost and for some reason they cannot explain must control it!! Outpost phase: At the beginning of each player turn roll a D6 to determine the effect of the outpost. 3) Unit/model is teleported 2D6 inches in a random (scatter die) direction, if contacts enemy unit/model counts as charging. Determine new facing by rolling scatter die. A roll of a hit when determining distance just changes facing. 4) The outpost whirls with mystical energy and casts a random spell. Each player picks one of the eight lores from the warhammer rulebook and then dices off to see which lore is used. The tower then casts a random (roll a d6) spell from that lore at irresistible force. Spells that do not need a target (comet of cassendora) land 6D6 in the direction shown, or on the outpost if a hit is rolled on the scatter dice. 5) Unit/model takes D6 st3 hits but receives regeneration. 6) Power vortex- Each player rolls a D6 for every power and dispel die they gat that turn on a roll of a 1 they lose a die on a 6 they gain a die. Once the effect has been determined roll the scatter die, measuring from the centre of the outpost the 1st Unit/model that intercepts that line will be the target of the effect. If a hit is rolled on the scatter die every unit/model within 12 inches will be effected. Because of the extra VPs available in game 3, I made sure to protect my general fairly heavily. The Outriders give me enough shooting to hopefully deal with anything big and nasty before it gets too close, and I wanted to include a Helstorm after it's efforts last year. No cannons, as I copped a lot of flack last year when I brought along two cannons and a Helstorm (mind you, that was my only shooting). I still need to greenstuff the gap on the top - I filed the edges back so they fit fairly closely together, but it's not perfect. Next up, we have a Dark Elf Sorceress. The model originally comes on a Cold One, but I already have one like that, so I figured I'd convert this one onto a Dark Steed. The original rider, up for trade. Hmm, thought I had some in-progress shots...will post them when I find them. Bits in all their glory! The Champion in progress. I was a little worried about this one, as the arms didn't seem like they were going to fit perfectly, then I wasn't sure if the rifle was going to be poking the guy next to him in the head. Luckily, the guy next to him is a muso, and so didn't have a long barrel to get in the way. Well, this post become pretty heavy pretty fast lol. Cheers folks. My opponent in Round 3 . The tournament seems to have a mixed bag of armies coming along, though there's at least three Daemon and three Dark Elf armies in the 40 competitors. EDIT: I just had a read over the tournament entries (they're posted in a thread in my clubs forum). 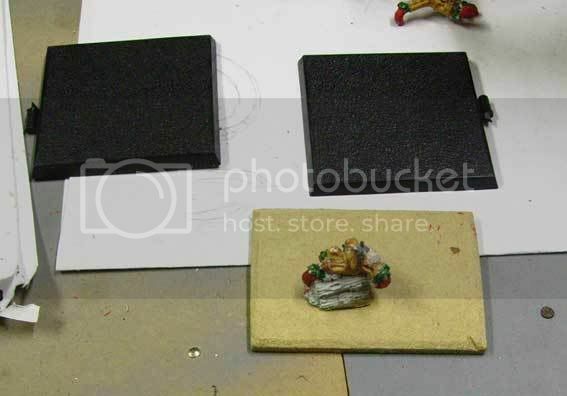 In a field of 40 (only 37 entries so far, but they'll fill up pretty fast I imagine) there's 6 Dwarf armies, 4 Empire armies (including me), 2 DE armies, 2 VC armies and a smattering of basically everything else. 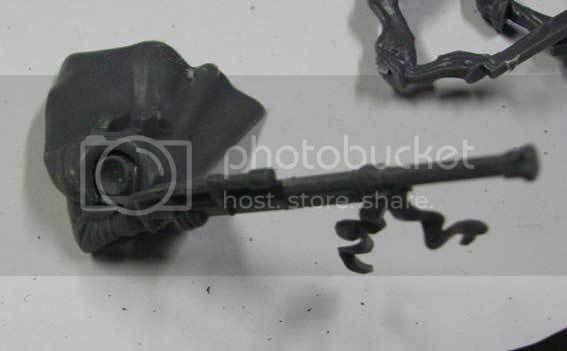 Surprisingly, there's only 2 Daemon armies so far - one that's heavily Slaanesh (she used to run Daemonic Legion, so has been playing around with Chaos for a while) and another one that's just a new 'generic' Daemon army. There's also 9 people who haven't posted what army their running yet, so I'm expecting more Daemons to show up . Well, this has been a long time between updates...apologies to all, I've been outrageously busy with work and uni, and just never quite got around to writing any updates. Results from the tournament: 3 massacre losses against Dwarves, Lizardmen and Skaven, and a solid loss against Tomb Kings. Just wasn't my day haha, but good soft scores meant I came in second last instead of repeating the wooden spoon result of last year. I even scraped a vote for best army (which I couldn't believe, considering how little of my army was actually painted!). Hopefully next year will be a little better, as I intend to take along my recently obtained Skaven army (and I promise that this had nothing to do with the fact the top three finishers were Skaven this year!). 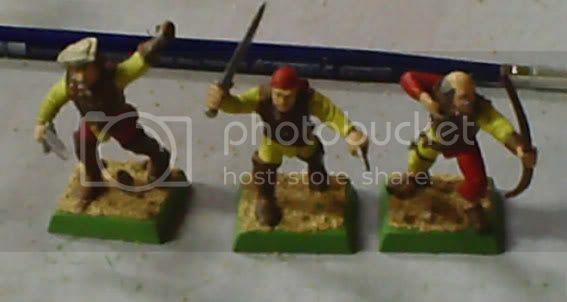 Painting/modelling updates of current on-the-go projects forthcoming. Just a quick note re: banners. I've found a nice and easy way is to create them using Hi-Res photo's etc and then just print them off on a nice colour printer. 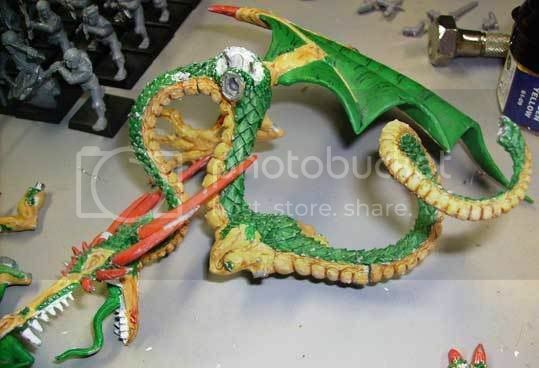 Then its just a fold and glue and presto - fantastic banner 100000x better than anything I could paint. 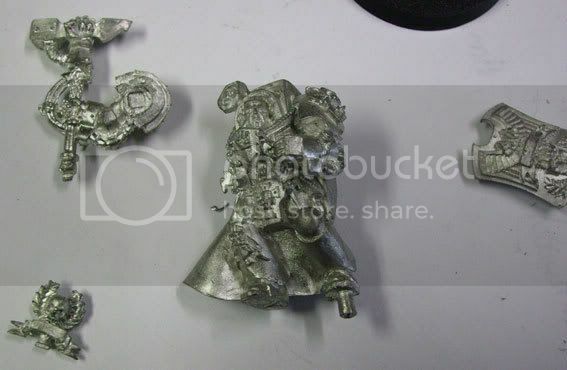 Quick update with a before and after of the Terminators I'm stripping. These boys have been on hold for a while, but I'm optimistic that I might be able to get something done on them this summer. For once, I'll actually be showing off some pics of work that has shown up in this thread before. Getting these Free Company finished ended up being my New Year's resolution (pretty poor I know...after all, coulda been something like become a diplomat and end the Middle East crisis...), and so far they seem to be coming along pretty well. These pics were taken using my new Christmas present, so are a little blurry (haven't quite got the macro setting on this one nailed down; I keep getting pretty sharp shots of the paint pot behind the models I'm trying to shoot). 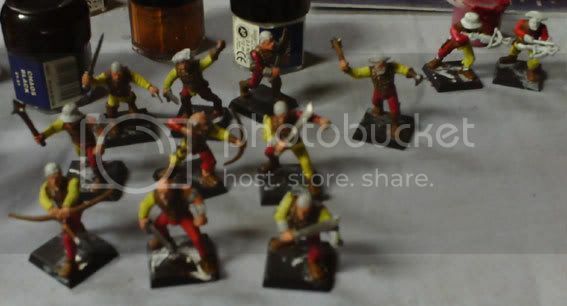 Since these pics were taken, I've finished the first ten of the two units (all the models you can see in the first pic except for the two with crossbows). 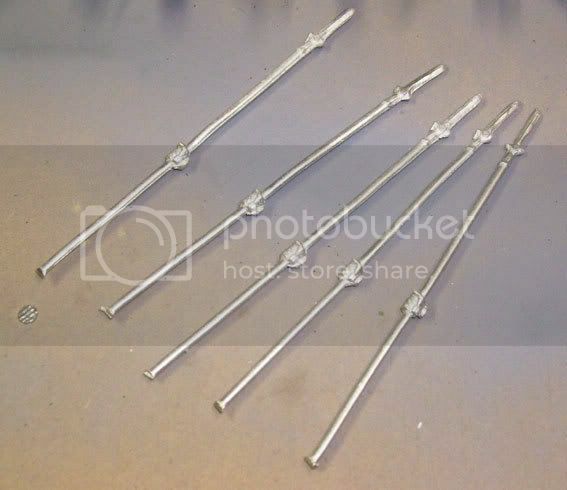 Oh, and I've also finished stripping and rebasing all of the metal termies bar two I need to find weapons for. Came up looking quite nice; will also try to include some pics of these guys.